A few months ago, the board gaming community held its collective breath as it awaited the results of the Spiel des Jahres awards. If there were an Oscar for board games, the various Spiel des Jahres accolades would be our golden statue. It’s our Pulitzer, our Cannes, our Grammy. 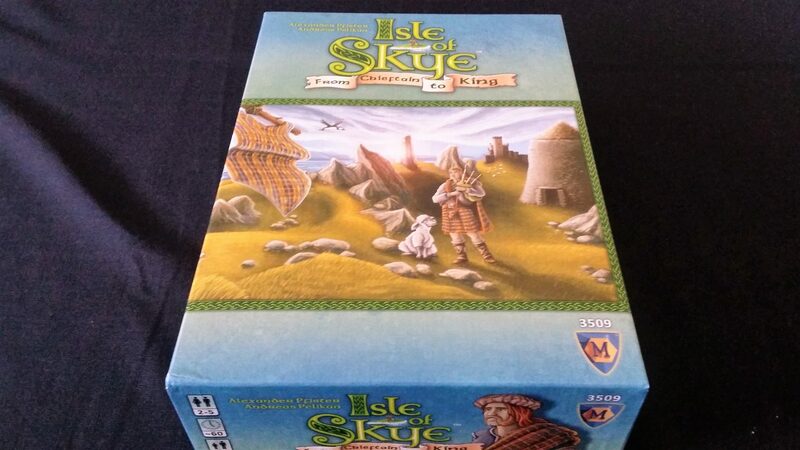 And this year the Kennerspiel des Jahres went to Isle of Skye. 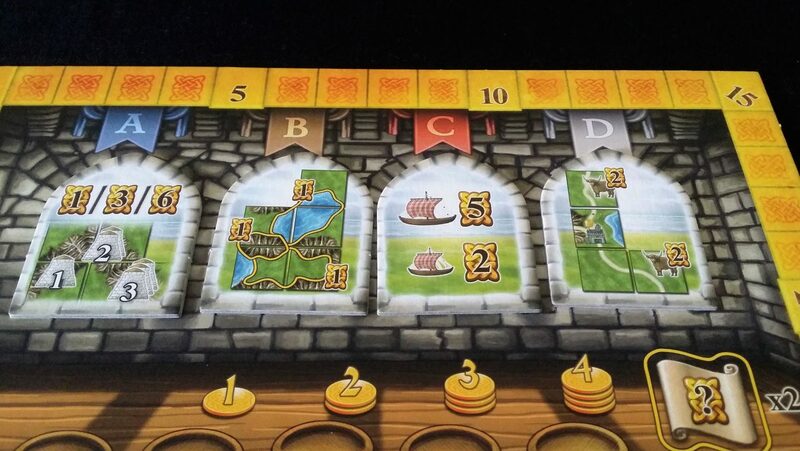 The Kennerspiel can be loosely translated as ‘expert game of the year’, and goes to the more interesting, more expressive games that are beyond the instantly tractable titles that are the focus of the Spiel des Jahres proper. These are the kind of games that board game snobs, like myself, might sniffily recommend when people have grown out of the simpler, family-oriented titles that win the main award itself. As an aside, don’t ever let those dreadfully tedious people tell you what is and isn’t okay to play – enjoy the recreation that appeals to you. It won the award against some serious competition. T.I.M.E. 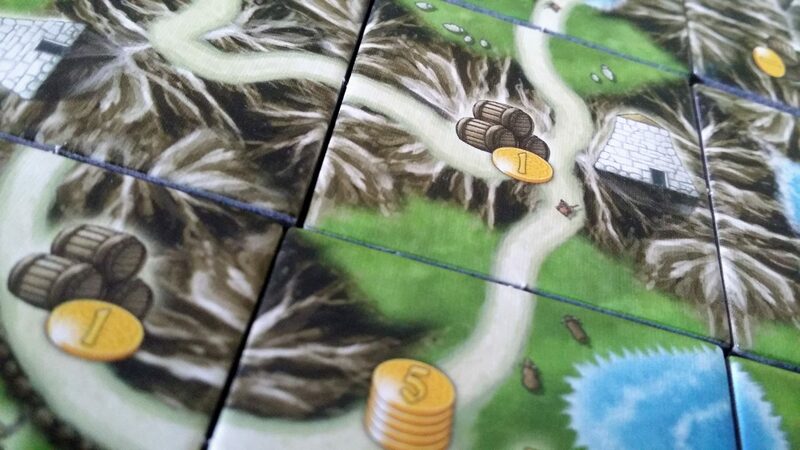 Stories is a game with a remarkably dedicated following, an adventurous business model and a game-play design that pushes the barriers of the hobby. Pandemic: Legacy soared to the top of the Board Game Geek charts and stayed there representing as it does the current pinnacle of the exotic legacy game. Isle of Skye, in comparison, is a very likeable game but not exactly genre shaking in the same way as its competitors. For those that don’t know, the Spiel des Jahres award is a mainstream stamp of approval. A game that wins one of these will end up supermarkets all over Germany. They’ll become smash-hits – in an industry where 5,000 sales is a comfortable success, they’ll often shift a quarter of a million copies over their lifetime. It’s a big deal. It’s also a deal that encourages a certain conservatism when winners are selected. Many people will pick up the Spiel des Jahres winners as a matter of course – they’re generally not looking for experimental design or striking innovation. They’re looking for fun in a box that they can haul out, play with their friends and family, and then put away and not necessarily think about again. They’re not looking for the ‘one shot pistol’ of T.I.M.E. Stories or the campaign-based commitment of Pandemic: Legacy. As such, Isle of Skye was a perfect fit for the award, because fun in a box is exactly what you get when you buy it. 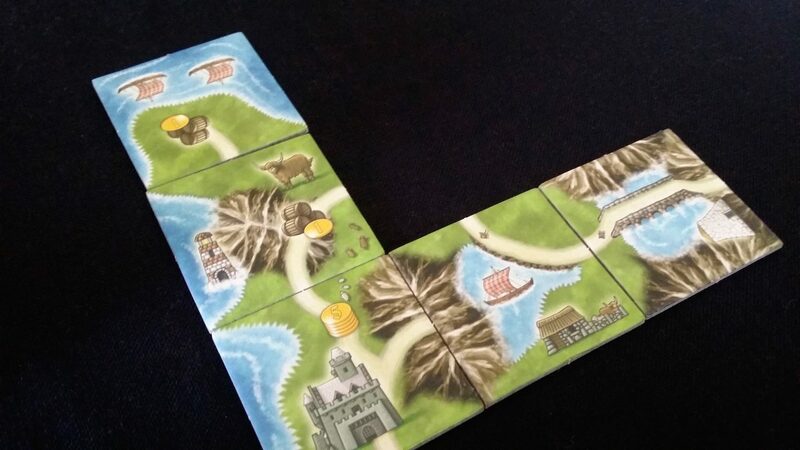 It’s a profoundly safe design – an iteration over the proven tile-laying formula of Carcassonne with an extra dollop of interesting game mechanics ladled onto the top. 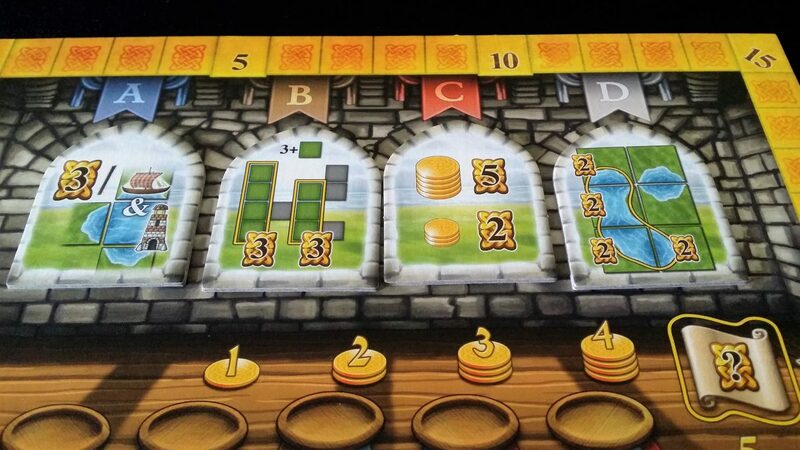 It feels in many ways like Carcassonne 2.0 – a competent evolution, but fundamentally anchored in shallow waters. 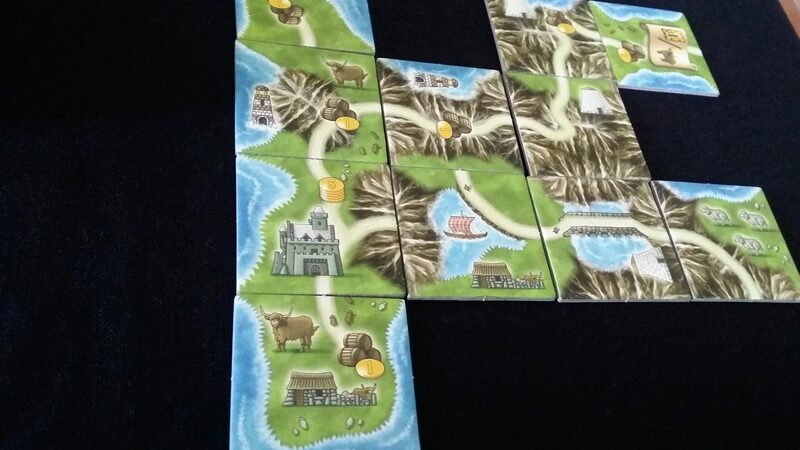 Carcassonne is a game of continental sized importance in the board game landscape, and Isle of Skye never ventures out of eye-shot of its shores. You make me feel like a natural woolman. C’mon guys. We know what you’re implying here. Why do Scotsmen wear a kilt? It’s because sheep can hear a zipper a mile away. I’m not remotely trying to claim Isle of Skye is offensive, because it really isn’t. It didn’t upset me, it just made me roll my eyes. It’s theming at its most careless and lazy – there is nothing in the game that is actually about Scotland. In attempting to give it a pasted on aesthetic they’ve gone for the simplest and least imaginative twee representation of a complex country. 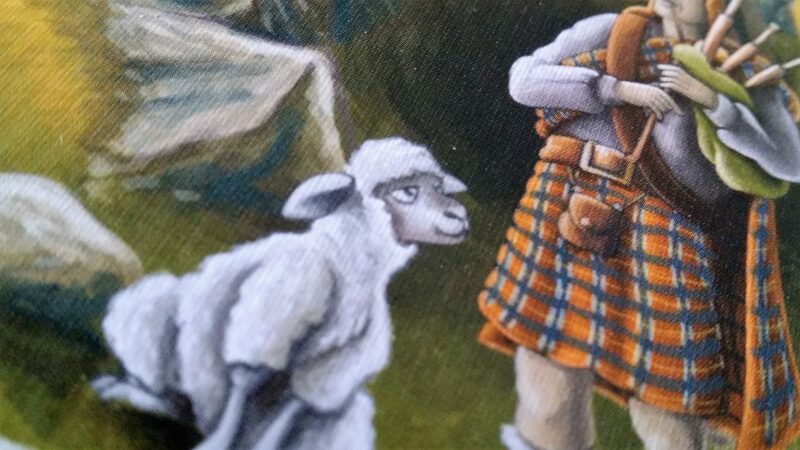 Do you want a board game that properly captures the historical spirit of the Highlands and Islands? It’s out there. It’s called Game of Thrones. Yes, all of those things are true, but Isle of Skye is actually a great game so it’s okay to look past all of this. There’s nothing wrong with cleaving to that which is known to work, and Isle of Skye is tremendously competent in the way it enhances and enriches the core formula. It adds new and interesting decisions, and a depth to the tile-laying that in many ways renders Carcassonne all but obsolete. The first evolution in the design is that you’re not fighting over a shared landscape – each player is working on their own patch of a Scottish island. The tiles you place are yours alone. That’s nice, and lends a real sense of ownership to the landscape you are constructing. The second evolution is that it adds a greater tactical variety to the tile collection and placement. You’re not just picking the next one and laying it in an optimal location – you’re bidding and bartering over tiles, and then working out how your purchases best fit into the island you’re trying to create. That’s great. But the best evolution is in how Isle of Skye creates the context for meaningful strategy and tactics. 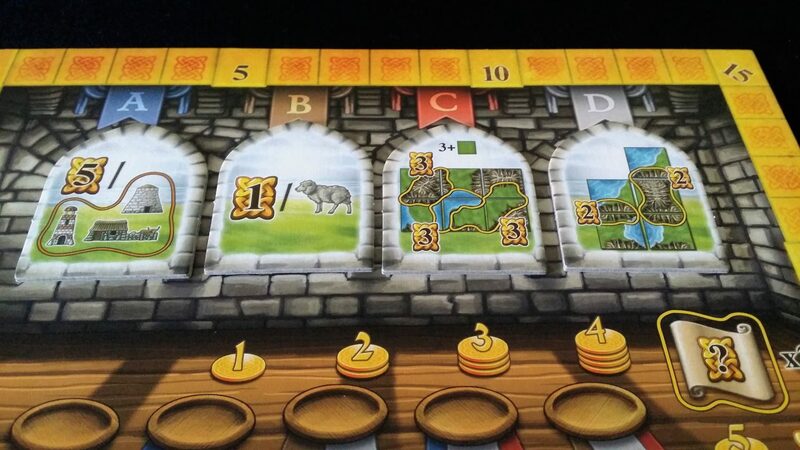 Carcassonne is a tremendous game, as you can see from our review. Isle of Skye takes the relatively tame strategic decisions of Carcassonne and kicks them to the curve. It adopts a system of randomised scoring, which will hugely influence the development of your islands. On top of that it adds a system for bespoke scoring that you construct as you buy tiles. Everyone shares a scoring context, and then supplements it with the tiles that best suit their strategy. In the process, they subtly alter the underlying economics of the game and create all kinds of tactical decision-making challenges. It’s the economy as defined by the collaboratively constructed scoring that is the heart of the game. Let’s talk about how it does those things, because it’s an interesting design. First of all, you draw four random scoring tiles from the box and you place them on the scoring track. This is what Skye actually looks like. Mountains, sheep and more mountains. That’s Scotland alright. Actually, I’ve never been to Skye. Maybe it doesn’t look like this. This time you’re being rewarded for boat and lighthouse combinations, for having columns of your island that are at least three tiles tall, and for having completed water features. You’ll also be rewarded for holding money in reserve. Okay, right, variable scoring rules. WE GET IT. This system is more than just the arithmetic of score calculation. Just like the nobles in Splendor, this is essentially the magic fairy dust that turns tile cost into an economy. Everybody is going to want the tiles that let you score according to these rules. 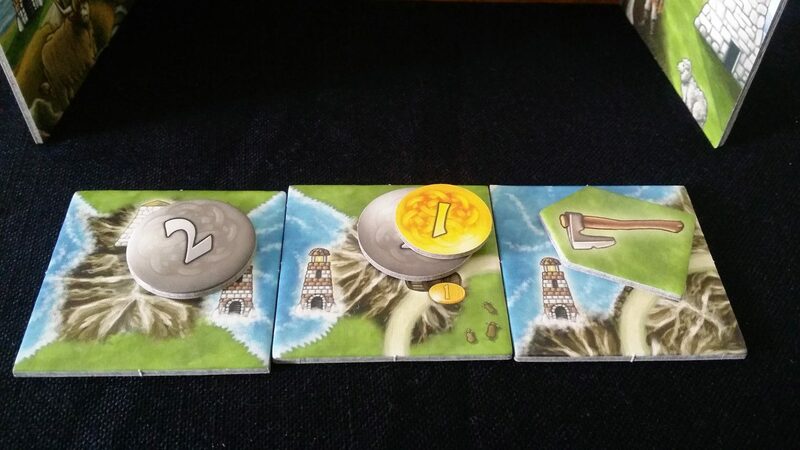 You are rated by a different combination of the tiles in every turn though so their immediate and long term value will shift as the game progresses and as your island takes form. 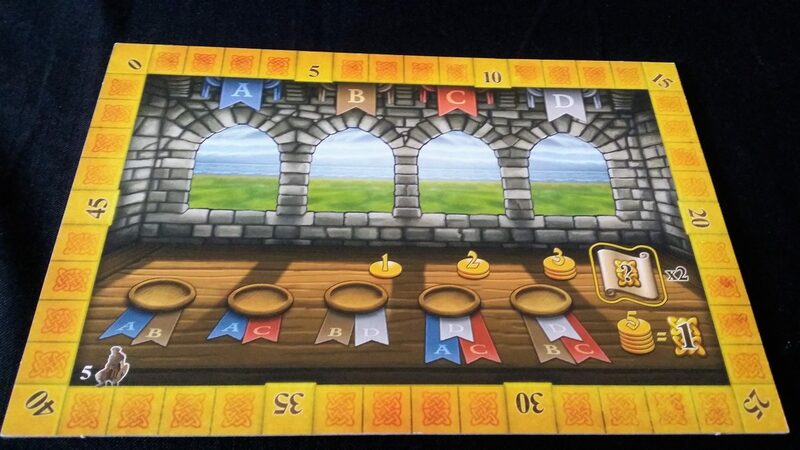 Each player begins with a castle, which earns then five gold coins per turn. And then each turn everyone draws three tiles from the bag, and then decides on the price they’ll charge for each. One of them is discarded, and returned to the bag, and the other two are put up for sale at a price you decide. You place your coins on the tile to set its value, and if someone decides they want to buy it you get their money and your money back. If nobody buys the tile, then you bought it and return the money to the bank. Man, I hope you wanted it. I have no money left with which to buy any tiles. I hope you’re going to buy my tiles. 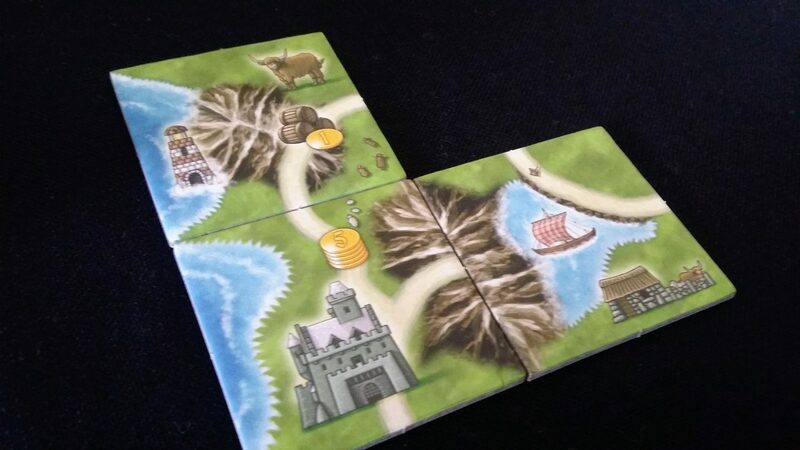 Everyone then places the tiles they ended up with, trying to build an island compatible with the scoring criteria set up at the beginning as well as one likely to generate sufficient income to offer fiscal flexibility in future turns. My island is lovely at this time of year. Presumably these scrolls are whisky flavoured. These are additional scoring rules that work just for you in the final phase of the game. You might get a point for every cow (or coo, as we say), for every sheep, or for every two distilleries. 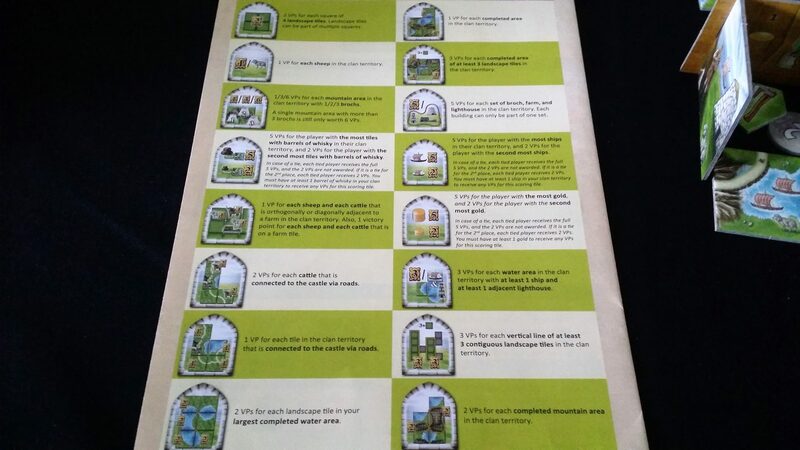 You might earn points for farms, or for ships, or for brochs and lighthouses. Where the shared scoring context is a macroeconomic modifier, here you influence the value of tiles for your own island only. Of course, that’s only in theory – the tiles have whatever value the group places upon them, and if denial of opportunity has an economic value then you just increased the worth of the tiles for everyone. You can see what I mean, I’m sure, by referring to it as safe. It adds a buying mechanic, parallel landscape construction, and variable scoring. All of these are great, and they absolutely meld together into a game that has a lot more player interaction and strategic depth than Carcassonne. But these aren’t original mechanics – we’ve seen them before, many times, in other games. What they don’t add, in other words, is any sense that the designers were remotely interesting in taking risks with their design. It’s the board game equivalent of an Adam Sandler film. Nobody is going to come away from the experience feeling as if they learned anything new. It’s a ‘best of’ compilation of a decade’s greatest hits. You will enjoy listening to it, but it’ll never be your favourite album. I hope. Nonetheless, while the whole is exactly the value of the sum of its parts, it manages to be an extremely likeable game. The land purchase system, more than the tile laying, is where the really interesting parts of the game come to life. The tactical implications here are so rich and thick that you can practically chew on them. Your initial bids set the price, but they’re also potentially bluffs and counter bluffs. Maybe you’re trying to make your opponents think you desperately want a tile you have no use for – will they pay over the odds to deprive you of some perceived advantage? Or will they ascertain your needs from the island you’re constructing and let you pay a painful price for a tile you didn’t want? Someone is going to buy the tiles – you better hope that you set the value in a way that gets you the things you want and doesn’t lumber you with the things you don’t. A high price is like sending a flare up into the air. It invites deep scrutiny of the state of play. Can your poker-face survive the illumination? And then the randomised scoring ensures that your games feel fresh, because it’s not only the scoring conditions that form the context of play, it’s also the order. Some tiles are going to be valuable right now, others will accrue value in the future. How do you balance short term versus long term requirements? Then onto that you add the scrolls that can make or break the game of a careful, canny player. 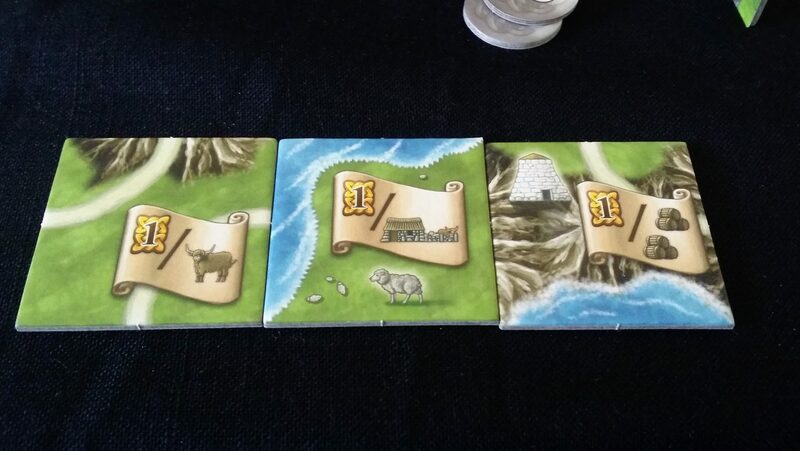 The right choice there can supercharge your points engine, or hugely influence the tiles you select in the future. You can take advantage of a marketplace of positional goods where the demand is set, at least in part, by you yourself. It’s competent, without being clever. It’s interesting, without being innovative. It’s riveting, without being revolutionary. It’s brilliant in places, but bland in others. It’s a game that I would rate as being more enjoyable than Carcassonne without actually being better. It’s an inoffensive design that is a lot of fun to play, and I think you’d be very unlikely to regret your purchase, or be challenged by the experience it offers. 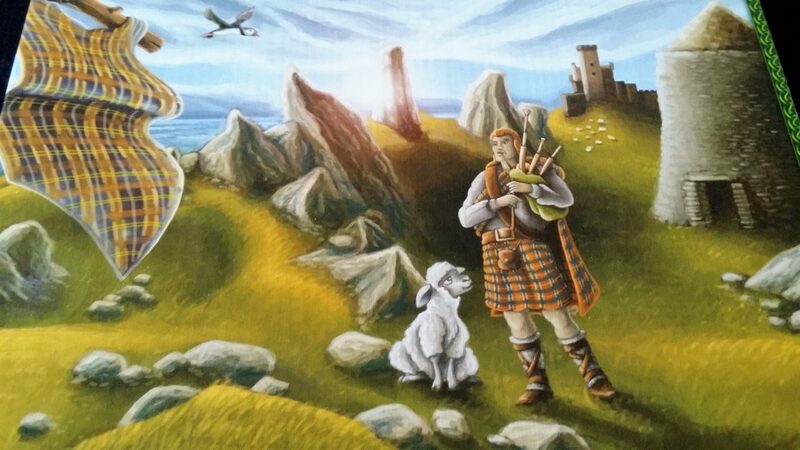 Isle of Skye is in other words, a perfect Spiel des Jahres winner and with the benefit of hindsight it’s the only possible candidate for 2016 that could have won. Can’t help but disagree. Isle of Skye is a far better game than Carcassonne, as it kills both that AND Castles of Mad King Ludwig. Skye is Carcassonne for actual gamers, offering meaningful decisions and just about the same number of replayability as Carcassonne with four or five expansions, while buyable at a fraction of the price.